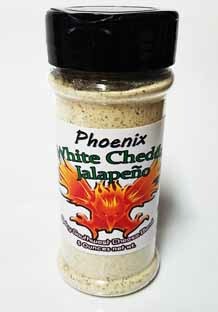 PHOENIX WHITE CHEDDAR JALAPEÑO - Real Wisconsin White Cheddar Cheese powder mixed with pure jalapeno makes this great tasting cheese powder that is great on popcorn, pasta, pizza, soups, salads or anything you wish. Blend with sour cream to make a great white cheddar jalapeno chip dip. Enjoy!